(Newser) – Donald Trump continued responding to allegations of sexual misbehavior in a controversial fashion Friday, saying that a woman who accused him of groping her on a plane "would not be my first choice, that I can tell you." The statement came during what the AP calls a "rambling attack" on Trump's female accusers during a campaign appearance in North Carolina. Two more women came forward to accuse Trump Friday, including Kristin Anderson, who said Trump groped her while sitting next to her at a New York nightclub in the early 1990s. 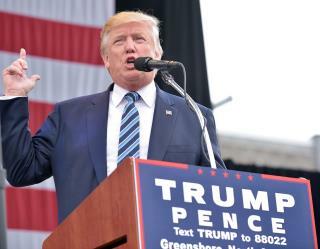 During his North Carolina appearance, Trump actually acted out that accusation, the AP reports, reaching out his hand to touch an imaginary woman as Anderson described while calling her claims "unbelievable." Next on Newser: Is One State About to Legalize Pot for Kids? Would he be impressed if Tammy Duckworth WHEELCHAIRED by him? Trump on TV. I wasn't impressed. Gay friends not impressed either. Hopefully, he won't thrust his "shortcomings" at her at the last debate.